Cirque du Soleil productions pair incredible physical spectacle with gut-busting comedy and for those reasons, they are not to be missed. 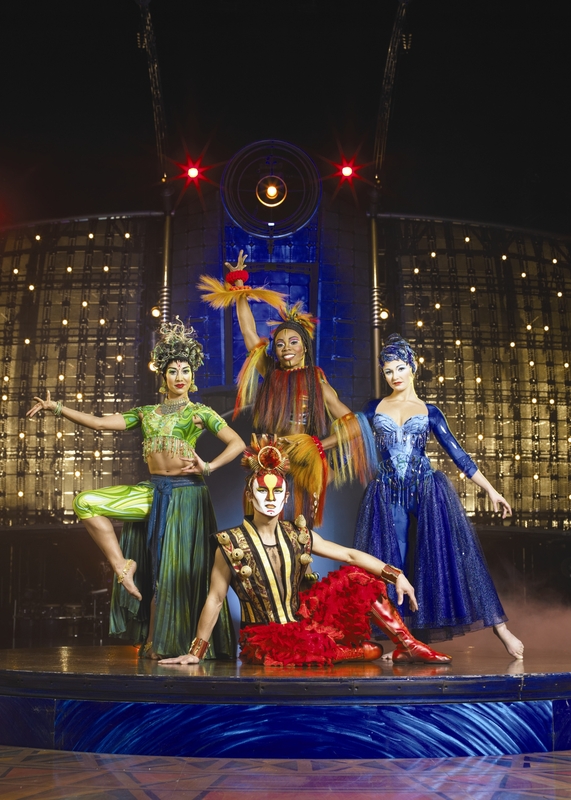 Cirque’s “Dralion” came to Raleigh’s PNC arena last Wednesday, and though its choreography was perfectly executed, it wasn’t my favorite Cirque production. 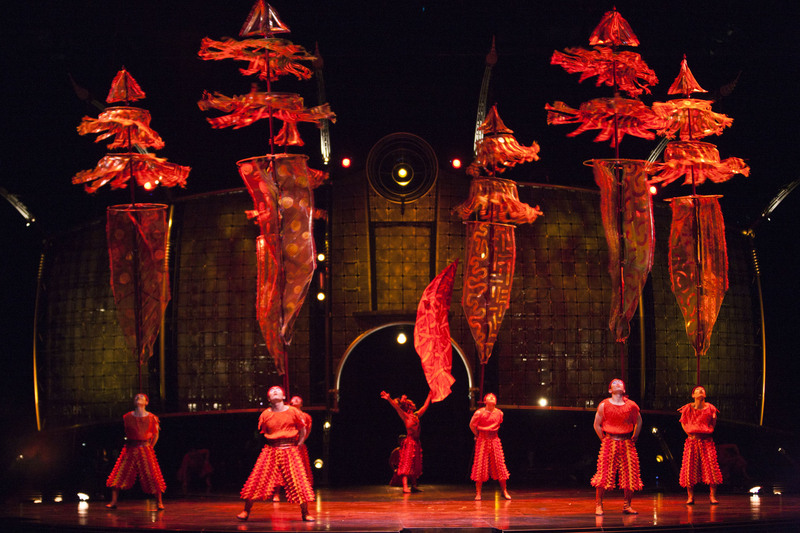 “Dralion” illustrated the quest for harmony between humans and nature, as described in Eastern philosophy. 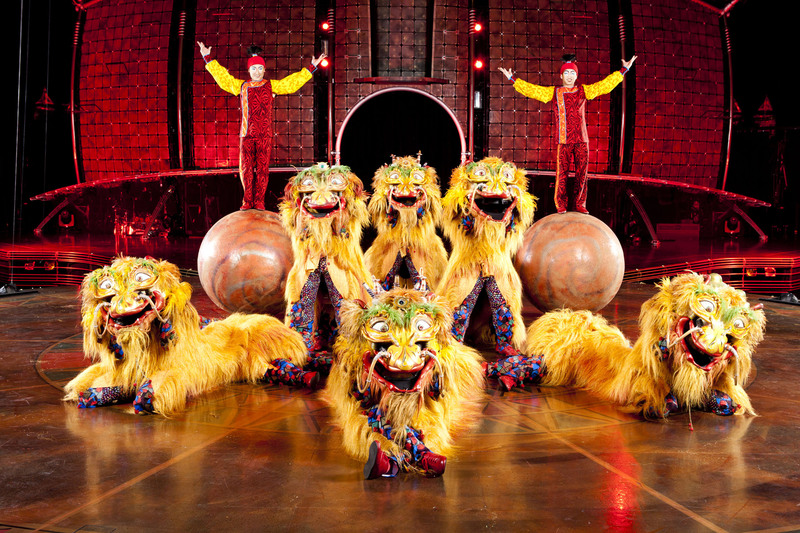 Different colors and acts represented the four natural elements – air, water, fire and earth – and the “Dralion”, a lion-dragon hybrid, represented the blending of Eastern and Western cultures. Each natural element had a representative soloist: Oceane, the Water goddess, draped herself in green and performed traditional Indian dance vocabulary; Azala, goddess of the Air, wore blue and ruled the aerial silks; Gaya, goddess of the Earth, dressed in ochre and expressed herself through African dance; and Yao, the Fire god, sported red and gold and wielded a spear. 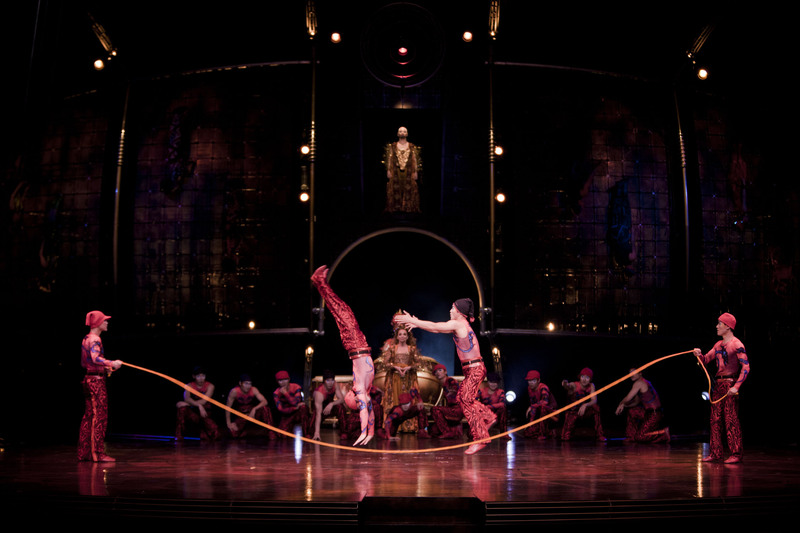 Each spirit governed the performers whose acts fell in his or her kingdom, and together, the “Dralion” company created a balanced ecosystem onstage. But that doesn’t mean that the show lacked dynamic energy. At choice moments, Chief Elementals rushed the stage, battling for the chance to showcase the performers in their respective domains. Gaya’s posse excelled in hoop-diving, an act borne of Chinese acrobatic tradition. Clad in ochre bodysuits with stripes and spots, the acrobats were like ninja-cats as they dove, rolled and flipped through hoops with grace. Precise partnering showcased both the performers’ physical prowess and their ability to work as a team. Though Yao’s weapon of choice was the spear, his acrobatic corps preferred the bamboo poles. These poles, adorned with red decorative fabric, devoured vertical space like the flames of a fire. Acrobats kept the poles in flight by balancing the pole bases on their biceps, chins and palms; the men also launched the poles into the air and dove or flipped beneath them, always returning to upright positions in time to make the catch. Azala’s aerial pas de deux with a male partner was a bit less flashy. This particular act was more intimate than the rest of the show; Azala chose moments to close in on her partner but their relationship never felt permanent. That didn’t make the act any less beautiful, though; standout moments in this act were a midflight near-kiss and the image of Azala, suspended upside-down in a perfect center split, carrying her partner’s entire weight with one arm. Oceane performed traditional Indian dance vocabulary while flanked by a crew of trampoline artists. 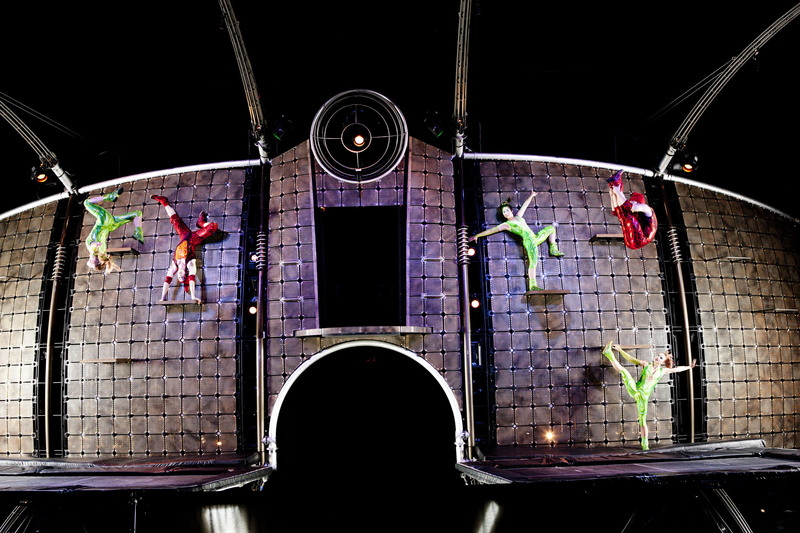 Four trampolinists performed gravity-defying feats, leaping across a gap between two trampolines and launching themselves up a 26-foot tall aluminum wall. The male trampolinists seemed to travel the furthest vertically; one even jumped onto the wall’s top and landed balanced in a handstand. The Dralions also displayed incredible balance. 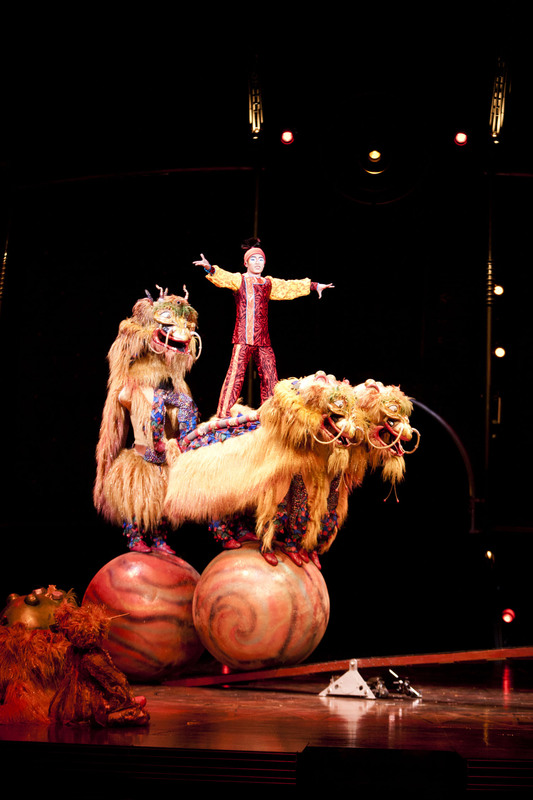 The show’s namesake, these mythical creatures were portrayed by two performers each – one for the front legs and one for the hind legs. Dralions balanced atop large wooden balls like elephants at the circus, sometimes two occupying a single ball simultaneously. At times the Dralions chose to “rest,” but even during these moments, the characters’ simple head bobs were enough to inspire smiles in the audience. “Dralion”’s diverse performance lineup also showcased aerial hoop, juggling, skipping ropes and Diabolo (Chinese yo-yo), and of course, Cirque’s characteristic over-the-top clowning. I won’t give away any secrets about the clowns, but I will say that I have never laughed so much during a live performance. And for that alone, “Dralion” is worth viewing. Khecari Dance Theatre’s “The Clinking, Clanking Lowesleaf” was built for an intimate space – a space that could be dissected, explored and transformed in all directions by lights, bodies, wires and blocks. A space that could tightly wrap its audience members in darkness, keeping them keenly aware of shifts in energy, shifts in choreographic intent, and even shifting stage curtains. The DCA Storefront Theatre, therefore, was the perfect venue in which to view this piece. Jonathan Meyer and Julia Rae Antonick perform in “The Clinking, Clanging Lowesleaf.” Photo Credit: John W. Sisson Jr. The inspiration for “The Clinking, Clanking Lowesleaf” stemmed from fairy tales, whose traditional gender roles challenged choreographer/performers Jonathan Meyer and Julia Rae Antonick. The pair reconfigured traditional fairy tale tropes to explore the stories’ underlying themes – good v. evil, frivolity v. morality, etc. – and used that information to build movement. The dancers took clear physical ownership of the resulting choreography while allowing their interpersonal relationship to remain in constant emotional flux. Repetitive musical loops mixed with human voices and static intensified this work’s eerie tone. 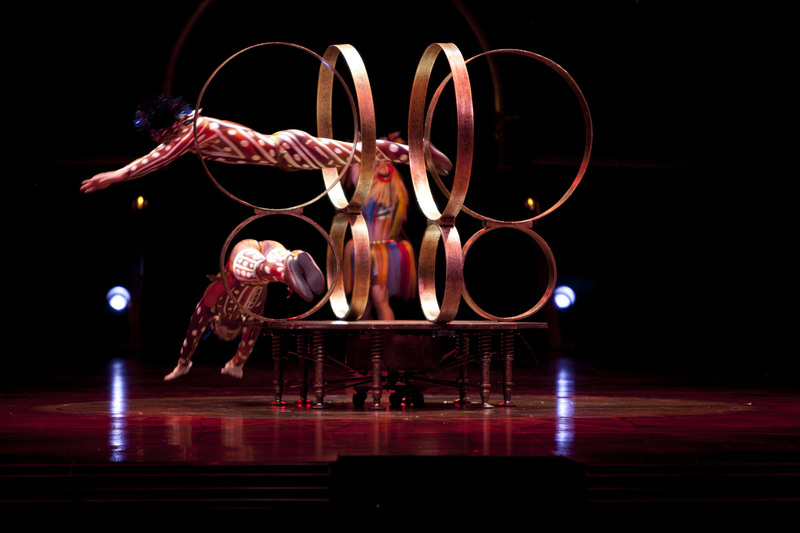 Throughout the evening, Meyer and Antonick used one another’s bodies as sentient props, rolling over them at unique points of contact, restricting or restraining their movements, and using their weights to counterbalance personal instabilities. One memorably awkward partnering moment featured Antonick standing on Meyer’s ankles as he, inverted in a Yoga Plow position, pulled his body forward like a human inchworm. “Pales,” was thematically dense, to say the least. In this work, two men and two women shaped a collective identity through religious rituals, intimate partnering and, at times, highly presentational unison group choreography. At the beginning of this work, hooded costumes emphasized and enhanced the alien movement qualities of anonymous dancers; articulate body rolls, quick head twitches and sharply bouncing squats were made creepier by dancers’ claw-like hands and upward gestures. As time went on, the dancers performed repetitive partnering sequences; the two men competed with power moves and shifted positions on the floor while the two women formed a more intimate (but not sexual) connection. Dancers broke the work’s abstract nature in moments of dance class-like choreography; simultaneously, Grant and Meyer commented from above the stage like the stodgy critics Statler and Waldorf from Jim Henson’s “The Muppets”. Though Grant and Meyer’s words were notably nicer than those of their Muppet counterparts, the intention behind them was equally insulting. Set to a mix of religious music, found sound and piano composition, “Pales” was compositionally complex – both musically and choreographically. Though I’m not sure whether I liked or disliked “Pales” as a whole, I will say this – it challenged me as a viewer of dance, and that, in and of itself, deserves recognition. Have you seen either of these works, or something else by Khecari Dance Theatre? Leave me a comment and let me know! I had an incredible moment yesterday when a good friend of mine (Shoutout to Libby Boudreau) showed me a version of Beyoncé’s “Countdown” music video that had been recreated Snuggie-style. I then returned the favor and gave her some dance history context for the original video. Moments like that, my friends, illustrate the ripple effect that modern dance has in today’s society. I encourage all of you to participate in conversations about dance, especially when it shows up in mass media, in an effort to keep dance history alive! You can start by sharing these sweet videos with your friends and/or family. I’m sure you will wow them with your pop culture prowess and mad dance history skillz. 2. Beyoncé’s music video for “Countdown” was clearly inspired by the work of Belgian choreographer Anne Teresa de Keersmaeker. Below is a split-screen video that illustrates the similarities between the two. 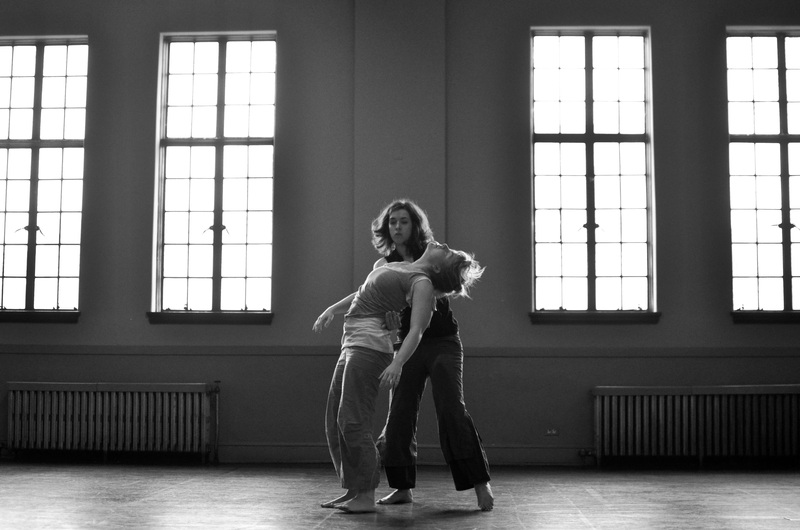 Learn more about Anne Teresa de Keersmaeker by clicking the link above. Please share your thoughts about this post in the comment section below, and let me know if these videos influence any of your conversations in the next few days!